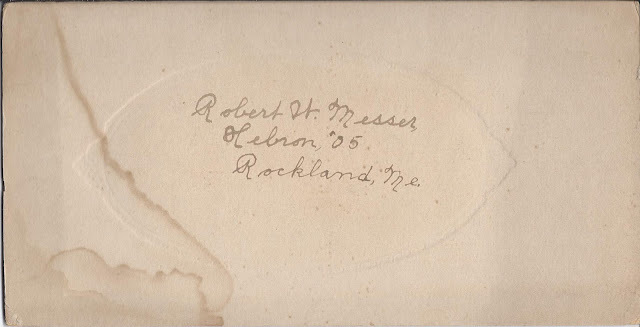 Photograph of Robert Walcott Messer of Rockland, Maine, that appears to have been taken upon the occasion of his graduation in 1905 from Hebron Academy at Hebron, Maine. 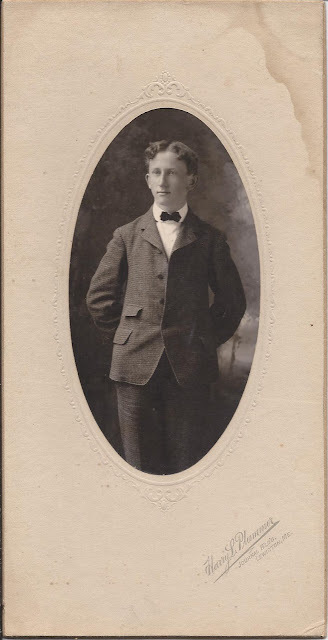 Robert Walcott Messer was born 19 April 1887 at Rockland, Maine, the son of Herbert Bird Messer and Nellie (Thomas) Messer, both Knox County, Maine natives. His paternal grandparents were Robert W. and Laura E. (Bird) Messer. His maternal grandparents were Leander and Frances L. (Thomas) Thomas. After graduation from Hebron Academy, it appears that Robert enrolled at Bowdoin College but had to leave because of ill health. He moved to California and graduated from Stanford in 1911. He became a teacher. At the time of the 1910 Federal Census, he was living at Palo Alto, California, with his widowed mother. By the time of the 1920 Census, he was living at San Francisco, California, with his mother and widowed paternal aunt Lorinda (Messer) Kennedy and her daughter. The 1930 Census found him still at San Francisco, but living only with a housekeeper. I don't know if Robert Walcott Messer ever married. He died in Los Angeles in 1986. Thanks for the post! I just added Robert W. Messer and his parents to my family tree. I already had Robert's grandmother, grandfather and his ancesters in my family tree. I have Robert W's grandfather as Robert Mathews Messer, and Robert Mathews parents are Parker Messer and Elizabeth Walcott.